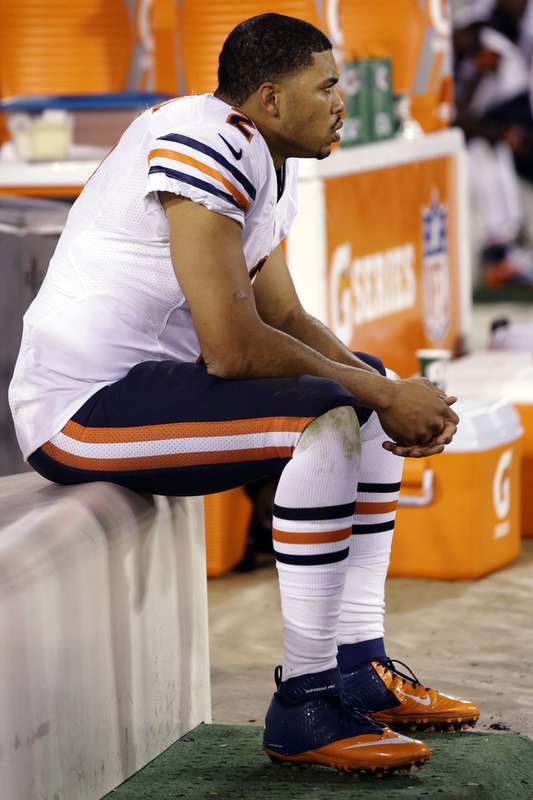 Bears QB Jason Campbell had a miserable night versus SF. Which was worse for the Bears, the offense or the defense? It was probably a draw, since both sides of the ball were so inept in this embarrassing 32-7 loss against the 49ers. With back-to-back losses, the Bears drop to 7-3 for the season. Now they have to figure out how to repair the damage. Bears offense was rather non-existent. They did absolutely nothing well: They couldn&apos;t run, they couldn&apos;t pass and back-up quarterback Jason Campbell was under fire the whole game, man-handled by an outstanding defense. San Francisco&apos;s Aldon Smith had a career night, adding 5 1/2 to his league-leading sack total of 15 — the most sacks by a single player in Monday Night Football history. It seems the stage is always set for the Bears to be on the receiving end of stellar performances like Smith’s. Matt Forte was held to just 63 yards, as a team the Bears only mustered 85 total rushing yards. Jason Campbell’s final passing numbers were 14 of 22 for 107 yards with two interceptions and one touchdown to Brandon Marshall. Week in and week out, the Bears&apos; offensive line has been inconsistent and self-destructive. But Jay Cutler&apos;s ability to make adjustments seemed to gloss over their warts. Without Cutler, problems were magnified, especially on national television. I can’t imagine the conversation Jason Campbell will have with Jay when he talks to him about this debacle. The way Campbell was battered on the field, newly signed quarterback Josh McCown was probably glad he didn’t have to enter the game. Offensive coordinator Mike Tice will get plenty of scrutiny for the game plan this week and the play of the Bears&apos; offensive line. Conventional thinking had most people believing the Bears&apos; defense would have a distinct advantage over second year QB Colin Kaepernick making his first start at quarterback. How wrong was that? This game ended with the young signal-caller looking brilliant from his first pass and continued as he superbly executed a complex offense. Kaepernick was 16 of 23 for 243 yards and two touchdowns. He spread the ball around to Vernon Davis, Michael Crabtree, Kendall Hunter and Frank Gore. There was minimal pressure by the Bears&apos; defensive line most of the game. Kaepernick eluded several opportunities to get sacked. With over a hundred yards on the ground and an efficient passing game, San Francisco wound up with 355 total yards. Kaepernick never looked flustered against a Bears defense that thrives on chaos and intimidating opponents. Instead, Lovie Smith’s team looked out of sync and meek. Note to Bears: Get to the West Coast earlier then one day before a Monday Night Game. The Bears defense prides itself on its ability to create turnovers and they couldn’t muster any against San Francisco. It’s a problem this season when the Bears have relied on the defense to score, when they don’t, it magnifies the weakness of this team’s offense. It is not a time to panic, but it is a time to be concerned. It&apos;s not surprising the Bears lost to Houston, and now San Francisco. However, the manner in which the Bears were defeated is a big issue. There are only six games left and the bulk of those games are in the division. Plenty of weaknesses have been exposed. This loss now puts the Bears in an undesirable spot: sharing first place with Green Bay in the NFC North. Next week, the Bears will have to regroup and meet Minnesota at Soldier Field. The big question now is whether Jay Cutler will be able to return to guide this Bear team. But the bigger question: Is the offensive line ever going to protect the quarterback? Follow Cheryl on Twitter @CRayeStout and on Facebook at Cheryl Raye-Stout #AtTheGame.